The Beatles: White Album – The hidden meanings behind the lyrics . Beatles Radio: The Beatles, Solos, Covers, Birthdays, News The Fab 4 and More! An unlikely setting for songwriting, a meditation retreat at an ashram in Rishikesh, India proved one of the most creative places for the Beatles. Away from pressures of superstardom, from February to April 1968 they composed 40 songs while studying with Maharishi Mahesh Yogi, founder of transcendental meditation. While in Rishikesh, Donovan suggested, because of their immense fame, the Beatles’ next album could be plain white and nameless. Thus The Beatles (aka the White Album) was born. I spent 20 years living with and working for Maharishi in his ashrams all over the world, including his ashram in Rishikesh. 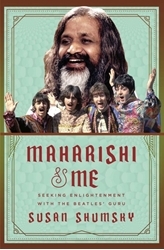 I was very lucky to get a unique insight into how Maharishi and the events that happened in the ashram influenced and inspired The Beatles. So, on the 50th anniversary of The White Album’s release, what are the hidden meanings behind the songs written under Maharishi’s influence? Mia Farrow’s sister “Dear Prudence” Farrow had abused drugs and alcohol as a teenager. While in Rishikesh, she spent nearly all her time in meditation. Trying to lure her out of her room, John Lennon and George Harrison burst through her door, singing Sergeant Pepper’s Lonely Heart’s Club Band and Ob-La-Di, Ob-La-Da. But she just wanted them to disappear.